Chopped is a popular food outlet in Ireland, with over 29 stores nationwide, with the first store opening on Baggot Street in 2012, and they are now expanding overseas. Owners Brian Lee and Andy Chen are passionate about the food they provide, using only the finest and freshest of ingredients to ensure consistently high quality. healthpro began to work with Chopped in 2011 to compile the nutritional and allergen profile of the entire Chopped menu. 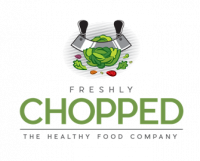 Through healthpro's Menu Mentoring programme, Chopped now offer their customers a full nutrition and allergen booklet which can be found in every Freshly Chopped store for your information. We are pleased to announce that Chopped will fulfil all necessary criteria for inclusion in healthpro's on-line platform for customer nutritional information provision, the Healthy Eating Guide.